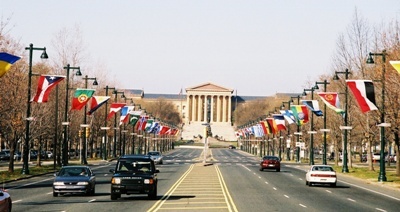 Benjamin Franklin Parkway is Philadelphia's Champs Elysees, a broad and magificent stretch of roadway flanked by the flags of all nations. The Parkway stretches from JFK Plaza - Love Park to the Philadelphia Art Museum. At one end of the Parkway is the Cathedral of SS Peter and Paul. The Rodin Museum is along the way, and there are fountains, small parks, statues and monuments along its length.The designers of the Parkway were Paul Cret and Jacques Greber, who were also responsible for the design of the Rodin Museum. Many parades and activities in the city take place along the Parkway.